The team of Inspectors were at the school in March for four days and observed a range of lessons as well as talking to pupils, parents, governors and teachers. 62% of the lessons monitored were "good, very good or excellent" while the rest were satisfactory. The key findings said that "Teaching and learning are always at least satisfactory and in the three younger classes, lessons have some particularly strong features". The inspectors also found that "A strong ethos fosters very good relationships and good links with parents. Pupils are well-behaved and demonstrate positive attitudes to learning." The Headteacher, Mr Paul Hiatt, welcomed the report: "We were particularly pleased that the inspectors recognised the improvements since the last inspection across a range of subjects including science, ICT, and speaking and listening. Maths, in particular, showed significant improvement in 2003." The report also revealed that the standard in Science at the end of year 6 is "well above average", reflected in the school's success in the UK National Science Challenge which it won last year. It also found that "there are examples of the highest quality of teaching in Year 2", and that the education in the Reception Class is "very good" in all areas of learning. On the pupils' attitudes, values and other personal qualities the Inspectors said: "Pupils demonstrate good, positive attitudes in lessons and are enthusiastic about taking up opportunities offered by the school. Behaviour is good and the school is free of harassment." The report awarded good scores in areas including the leadership of the Headteacher and of other key staff and the governance. There were also several very good scores, notably for "enrichment of the curriculum, including out-of-school activities". Mr Hiatt said: "We are pleased with the outcome of the inspection. Obviously there are always areas for improvement and in our case that involves literacy in Key Stage 2, although the inspectors acknowledged that we have measures in place already to improve standards in this area of the curriculum. 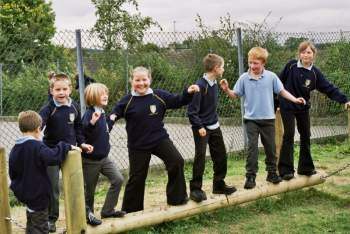 The British School is a happy school with a high and improving academic standard and a strong sense of community. Children are encouraged to take responsibility for themselves while showing consideration for others. It is clearly satisfying that all this has been acknowledged in the inspectors' report." More Ofsted Reports for schools in our area can be found here.